We were lucky to have the chance to visit the North Island, New Zealand. Where else do you find among modern societies that being barefoot is normal! I’m not talking about being barefoot at beaches or backyards, those are normal. I’m talking about walking around barefoot in shopping malls, sidewalks, grocery stores, restaurants, sight seeing facilities, and even in a walking trail in a forest. Barefoot in Huka Falls walking & cycling trail. Even in a walking trail in a forest, to see Tane Mahuta, the hugest giant kauri tree in the world! 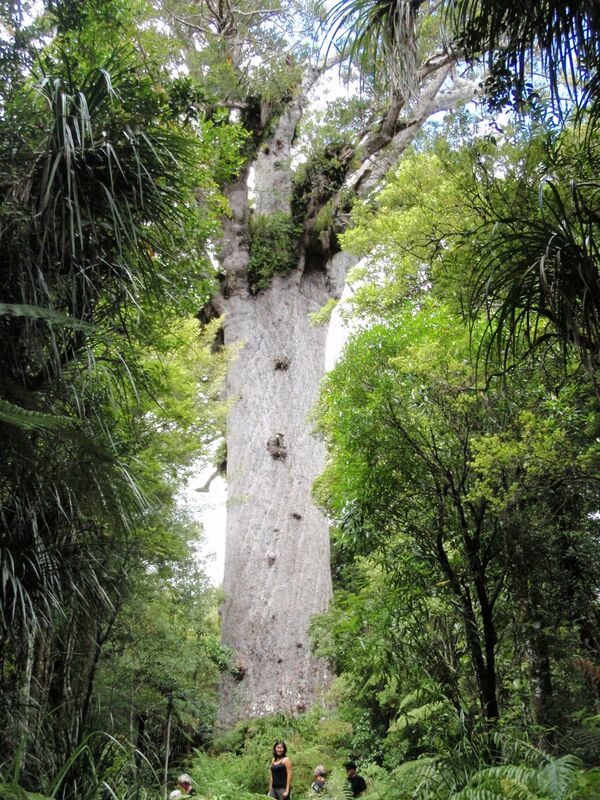 Here is a picture of Tane Mahuta, the kauri tree he was admiring. With the trunk girth 13.77 m, trunk height 17.68 m and total height 51.2 m, this largest kauri tree in NZ is impresive indeed. Wear some footwear though, if you want to walk around there. Now, being foot-injured doesn’t mean you can’t stay true to your barefootness! Even though barefoot courage from partner might be needed. 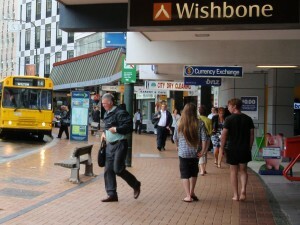 So, this barefootness is definitely quite common here in NZ, at least in the North Island. Sometimes this could be a serious problem, where they walk around in places where obviously you need a footwear coverage. For example in the walking path of geothermal areas where the ground is hot and sometimes its surface is fragile, where you could find yourself stepping into a boiling mud or pool if you are not careful. The geothermal area Crater of the Moon. 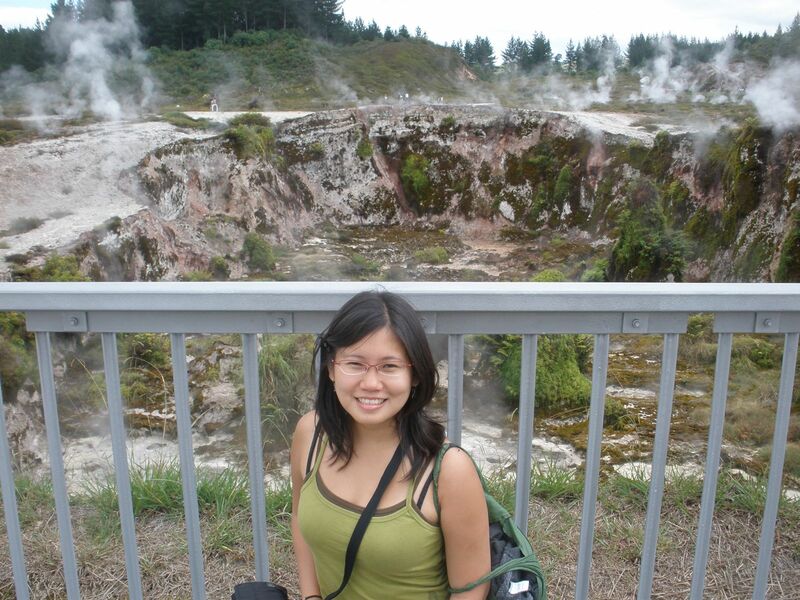 Showing a crater behind me, and a land with hovering water vapour behind it, from the cracks and pools on the ground. 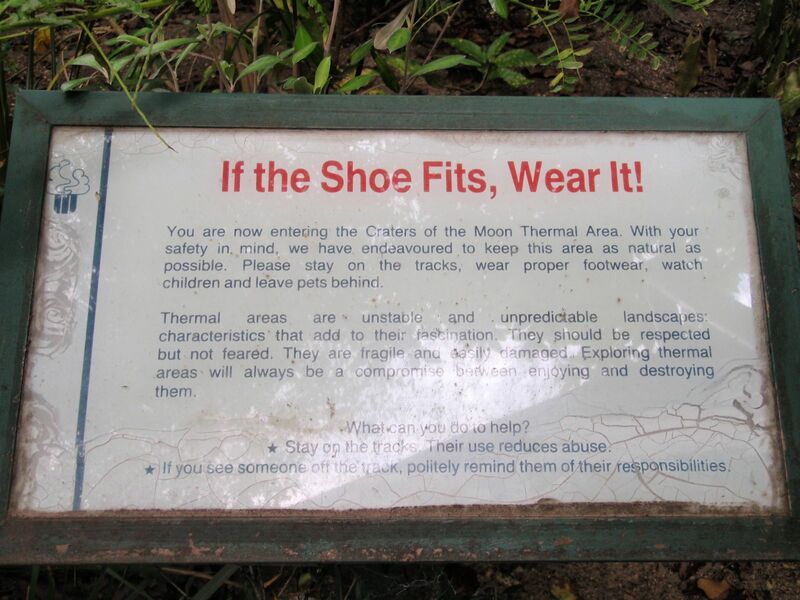 This famous and intriguing geothermal area called Crater of the Moon even made it clear by posting a warning sign in its entrance. Now I start wondering how it feel to walk around barefoot like these kiwis (by “kiwi” I mean the people of New Zealand of course, not the kiwi bird). Now, it will be odd if I try this in Sydney where I currently am: nobody does it here. Maybe next time if I’m lucky enough to visit NZ again? Sure I will carry antiseptic cream and some bandage in my pocket, you know, just in case. Or also a pair of shoes or “jandals” in my day pack, just in case I change my mind? Well, it was, in the US, if you have a time machine – 1969,1970,1971,1972…..it was a fad for young people, many did go shopping and do their daily errands barefoot, even in New York City, though the ‘old’ people of the day hated that. At least it was somewhat ‘normal’ among those in their teens and twenties, especially young women. But it all went out of style during the 1980s. Seems that it never went out of style in New Zealand. In the ’70s and ’80s in the U.S., young people in both coasts went barefoot a lot. AT the time, skateboarding was becoming popular, and many of the tricks of the day required being barefoot. Any place where I can walk around barefoot all day long seems like paradise to me!! That’s was a large aspect of the fad – hippies made it popular, and by 1970 or so it hit the mainstream population of young people – to be anti-fashion, and not buy the latest thing, to totally rebel against pretentious fashion designers and the corporate world telling you what to wear. (During the early 1970s, many teenage girls I knew would often say ‘I hate shoes!’ – the opposite of today.) And, because it just felt good to feel more of the world around you. After all, you do not wear earplugs just because you might hear something unpleasant, you do not wear shades and blinders because you may see something you do not like, and do not wear nose clips because you may smell something unpleasant. You experience your day fully, using all your senses. But by putting on even a pair of flip flops, you are cutting off 20% of experiencing your day. But you also have to realize, that before the 1960s, it was socially acceptable for kids to go barefoot everywhere, including stores and such, in many places in the US, especially in the South. It just was not considered ‘proper’ for adults to do so. The hippie generation broke that ‘unwritten rule’. But most adults had fond memories of being barefoot much of the time or all of the time during the summer. They remembered how they would gradually get their feet tough by taking longer and longer barefoot walks in the spring, and by summer they could walk on anything without pain or injury. But in today’s shoe-obsessed world, the younger generation does not appear to even know it is possible. That once-obvious information was not passed on to younger generations. And yes, sometimes people did get hurt, there is some risk, but then again, there is risk in playing sports – how many people get hurt playing sports, and can’t wait for the injury to heal so they can go back to playing sports again? If you are curious, read a NY Times article, from Sept 1, 1970, called “Shoelessness on the Rise” – it mentions that it was not uncommon to see barefoot couples waiting in line to see broadway shows, and young women shopping barefoot in expensive stores. Exactly. When I was a kid, everyone went around barefoot all the time in the summer. Crossing the street, we’d race across the hot asphalt to pause on the painted stripe in the middle, which was cooler. We’re in Australia now and there’s a bit of barefootedness going on here too, but nothing like in New Zealand. I love wandering around in bare feet. I was in NZ many many years ago, but don’t remember this. It’s one of the countries I want to return to, and next time………bare feet! I wonder was it like that too a few years ago. Most of the people are still wearing footwear, but I can spot several barefooter everyday. I’m going to try myself as well next time I see locals can barefoot and look normal. I did it sometimes when I was small, but not in more public place than inside my school. Now I occasionally do it if my high heel shoes hurt me too much (not an issue when I’m backpacking since I don’t bring high heel shoes). Ryan, where did you see it? I haven’t seen any of it here..
Shoelessness seems to be most popular with kids and teenagers here in NZ, and much less so with the middle aged and older. You do see some older people going barefoot, but its less common. My view is that a lot of people are doing it just to be seen doing it (maybe they feel it makes a statement about them), rather than for any practical reason. Sure, there are some places (beaches, grassy fields, etc) where it makes sense, but not in the city. Even if you have the toughest rhino-hide feet encrusted with calluses like plate armour, I still don’t see how it can be pleasant to walk over spit, gum, dog poo, garbage, cigarette butts, broken glass, etc. Plus, I’d think it’s easier to just take off your shoes when you get home, rather than have to wash your filthy feet before you relax on the sofa (unless you don’t mind a filthy sofa). Damn hippies. Yea.. My feet skin is very thin actually, even walking in rough stones, it’s kind of hurting already. I usually live in cities that the side walks are rather filthy, so… shoes on. I go barefoot everywhere, including in the city. I fully trust my tough skin, and it’s always more pleasant to walk barefoot, even at railway stations, large outdoor fairs and other places with lots of garbage. I’ve been barefoot for fourteen years and never stepped in anything that didn’t wash off. Dog poo is the grossest but I thought it was pretty gross to step in when I still wore footwear too… I’ve had to wash it off shoes with deep thread in the soles several times, once off a pair of white suede boots, and a few times off bare feet. Guess which of the three was easiest by far? Glass also isn’t a big deal, I stopped avoiding all but the largest pieces after about a year, and I have NEVER had a cut. Not once. Get a splinter maybe once a year, nothing to worry about. Feet are much tougher than those who rarely walk barefoot think, much tougher even than I would’ve believed when I started going barefoot. And I don’t mind washing my feet when I come home. Besides, shoes harbor many nasty bacteria, maybe we used to think we could judge how clean something was with the naked eye but since the invention of the microscope, we should know better. Your feet coming out of a pair of shoes may *look* much cleaner than my bare soles, and if streaks of sand, mud etc is the only concern, then you have a point. But if you actually want to keep the couch clean of germs (and especially prop your feet up on a table where you may put food, snacks, drinks) I’d strongly advise you to wash your feet before putting them up, regardless what you’ve been wearing. I go barefoot because I absolutely LOVE it, I enjoy every step, feeling the ground underfoot, every surface is a little bit different. Some warm, some cold, some rough, some smooth, some harsh and some soft. I don’t do it to be noticed, it’s a lot more noticeable here and it’s a bit of a hassle sometimes when people ask me about it. I just do it because I enjoy it, taking off my shoes was one of the best things I’ve ever done in my life. .-= keshie´s last blog ..booking tiket =-. Yup, I was quite astonished the first time I saw it just walking around the city or forest. Bare feet are considered more acceptable in NZ because so many people grow up that way. Kids regularly attend primary school barefoot and are encouraged to do all sport and PE barefoot even at high school level. School uniforms at intermediate and high school require uncomfortable roman sandals or heavy black shoes with knee socks. Wearing these uncomfortable shoes probably encourages teens to be barefoot as soon as they’re out of school. It should be pointed out that it is a regional thing in NZ to some extent. South Islanders and Wellingtonians don’t go barefoot much, even to school. This is probably due to the cooler climate. Smaller North Island towns and cities are the places you would be most likely to see people, even older adults, walking around shoeless. I think young adults in their 20s go barefoot just as much as teens if not more often. 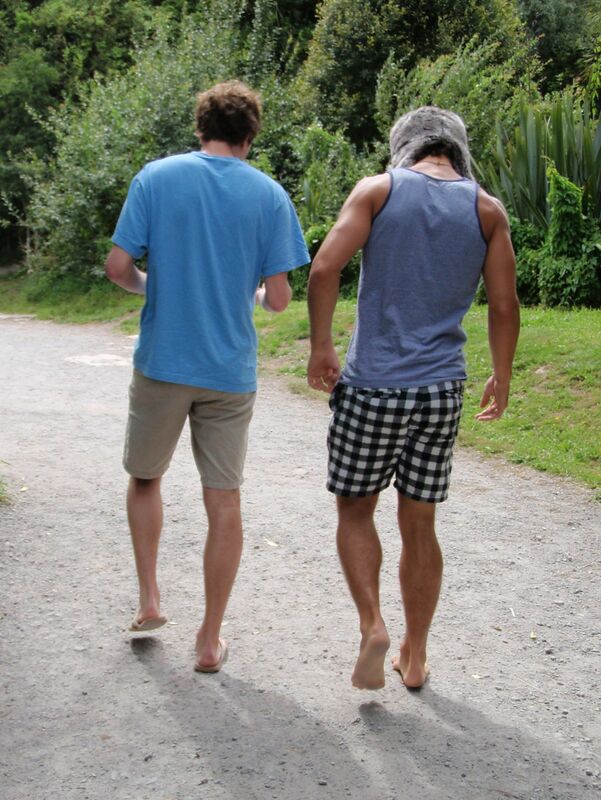 But it does seem that somewhere in their 30s most Kiwis loose their barefoot habits. Although my flat-mate, who’s well into her 30s never wears shoes but for work. She can goes days without putting any footwear on. I have noticed on trips to Australia that it is much more like the US in respect to footwear. Even in beachside communities in perfect weather everyone has jandals on. I find that odd since the two countries share the same fashion trends in almost all other aspects and because so many Kiwis more to Oz. Wow Newkiwi, thanks for this great insight! Answer my lots of question about it Did you use to walk around barefoot too? I wonder how do the people there avoid all of the sharp or slimy objects on the ground, just walking carefully, or NZ roads and public places cleaner in general? Right now I’m in downtown Sydney, and the side walks here have so many bubble gums being spitted on them, doesn’t look very inviting at all to walk without foot wear. What about wearing socks instead of barefoot? Is that seen as well? I like doing that (sure I have to wash the socks after wards). Glad I could answer some of your questions Dina. I still do go barefoot much of the summer and a fair bit in spring and autumn as well. I’m 24 so there are a good number of guys my age who still go barefoot a bit. I certainly don’t feel I ever stand out if I’m barefoot. It does seem a bit more common for guys than girls in their 20s. I don’t really worry about rubbish or glass on the footpath much but I don’t live in Auckland central and I don’t think too many people walk around the city centre that way. In the suburbs the footpaths are mostly very clean. Probably because people know the majority of primary school kids walk home barefoot along those footpaths every day. (most parents send their kids to school in shoes or sandals but they get them off the moment they’re in the school gate). I think it helps that unlike Oz we have no deadly spiders, no snakes, and it doesn’t get hot enough to burn your feet except at the height of summer at mid-day. Also being barefoot all the time gives us Kiwi Feet, meaning very tough thick soles that no glass slivers penetrate and sharp rocks don’t bother. I can comfortaby walk on gravel or stand on those sharp metal travelators at the mall, unless it’s early spring and my feet have gone soft from wearing shoes all winter. Kids’ feet are even tougher and I’ve seen many running on sharp gravel with no pain. Hey, it soudns like a nice place, I personally love being barefoot and I love the idea of a country when is not that weird; I would like to visit New Zealandin the future, maybe next year, for now I’m living in southamerica, I’m 21 and I wish I could run on gravel with no discomfort. Gio, it’s a truly wonderful place, you should go there sometimes I wish to have that strong feet too! Mine are too thin (the skin) and sensitive! I mean, if you look underneath my sole, they look slightly transparent with the veins. I want that Kiwi feet! My soles are so thin, walking in mild stones and rough sands sometimes already give me pain and little pricks (more so than people that I go with). Hey, I’m coming to NZ again soon, I’m so excited for it! It’s going to be in South Island mostly. I guess this time a year in the South Island, I won’t see many barefooter? I am sure you will enjoy your trip to NZ, I guess some of the locals can give you good advice in how to toughen your soles up and become a barefooter, so that you get Kiwi feet with nicely leathery, well inured soles. Good luck! I’ve only been to South Island once. It was in the spring and quite warm but I saw almost no one barefoot. I think even primary schoolers mostly wear shoes. That is except in the far northern parts of island, like Nelson. I guess maybe it’s warm enough there enough of the year for the barefoot style to develop. Going in winter I doubt you’ll see many people without shoes as it will soon be cold enough for snow down that way. 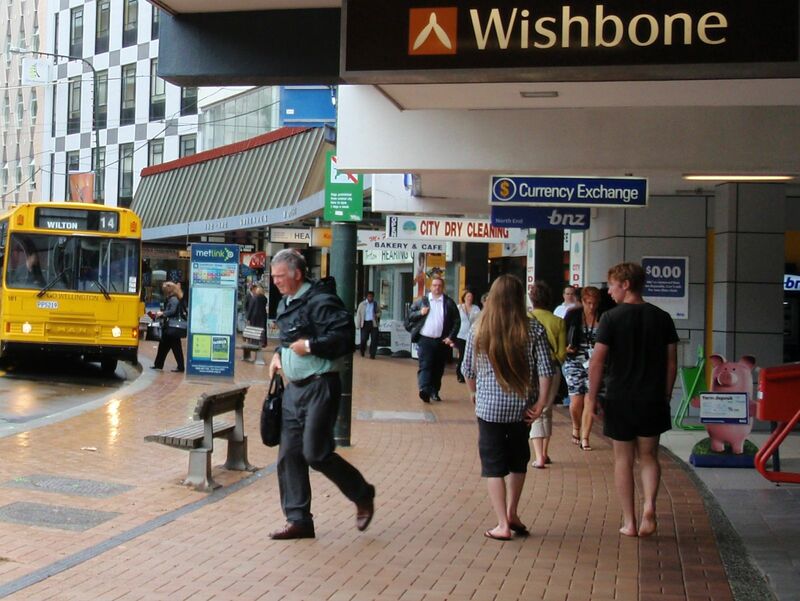 Up here in Auckland it’s been around 12-14C and raining all week but you still see a few people barefoot out in public on a daily basis. Getting tougher soles can take a little while and it doesn’t make you impervious. For example, even though I have no problem with sharp rocks or hard surfaces I can’t deal with heat. In the middle of summer I’m running across the black tarmac of the car park trying to stay in shadows. But I see plenty of others, who can’t have much tougher feet, walking easily along the burning pavement with no discomfort. I guess I just have a higher sensitivity for heat. Nothing I can do about that. Anyway you’ll love South Island, it’s honestly like a totally different country to the North. The air feels different, dryer, crisper. The scenery is incredible with massive snow-capped mountain ranges and stunning sights like Milford Sound. Try to get to the glaciers or go jetboating in Queenstown if you can. I can imagine there are a lot of things from the grounds that my feet won’t like. The head is a very valid point, mine has low heat resistance too. Also I don’t like to walk in cold surface. Sharps. Even “softs” like old bubblegum is yucky. But I envy those people that can do it. Yes, South Island feels totally different from the north. Both are stunning, but in really different way. Milford Sound is our favourite place on earth, if we could choose only 1. We were campervanning the S Island for 2 weeks, and we totally in love with this island! How was your experience wiuth respect to seeing barefooters and being barefoot yourself on the South Island? Did you finally get to do it? 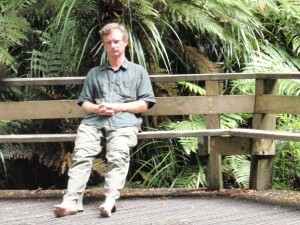 I was hitchhiking in New Zealand by the end of 2006, beginning from 2007. I am from Berlin, Germany, where is was quite common for girls in their teens to 30s to go barefoot in the city in the 80s. No, we were in the S Island for the winter. It was way too cold we didn’t even think about it. Hey, I don’t know that Berlin has it too! Or “had”. Is there anybody still around barefeeting? I would love to live there just because most of the people there go barefoot all the time. You should go there, the nature is stunning too! Is this a new trend? I have been to New Zealand but do not remember anyone going around barefoot. I too was in North island. Besides all the fun, I think walking barefoot would be good as we don’t have to carry our footwear. That said, I want to go back to that country… it’s too beautiful to be visited just once. Did you go there in the summer time? They are quite easy to notice. I didn’t see one in Auckland I think, but even Wellington has many of them. Also along the country sides. Totally agree with wanting to go back there, I hope to see it again one day. THere are a lot of places that we didn’t have the chance to see! Glad to hear you enjoyed your trip to the South Island Dina! It is a stunning place and I agree that Milford Sound is one of the most beautiful places on Earth. Incidentally when I went there a few years ago our boat tour guide pointed out the massive Mitre Peak mountain towering over the fiord and told us the story of his Kiwi mate who climbed it in true Kiwi fashion, barefoot! That’s how well-known Kiwis are for going shoeless. As for it being something recent, I would actually say it has probably decreased from earlier decades, though it would be hard to say for sure. Funny you say you didn’t see any in Auckland because this is definitely the most barefoot big city by far. Due to the cooler climate and dressier style Wellington doesn’t really do bare feet much. Kids there even wear shoes to school. Of course maybe you mean downtown Auckland, which doesn’t really count given most of the people there are tourists or office workers, also not likely to be shoeless. Recently we did an athletics day at the high school I work at. The kids actually take off their sneakers to run on the hot tarmac all day. Even after they have track-burn blisters from the rough surface they refused to wear sneakers. I’d say 90% of the kids did the whole day unshod. Why? Because that’s how they learned to run and play all sport at primary school. i grew up in the Bay of Plenty where most of us went barefoot all year , being near the coast helped . No one thought it was unusual . Feet got so hard we could go on anything , it never worried us . I lived in New Zealand in the 70s and I remember as a child we always walked barefoot. it took me a long time after we moved to Holland to get used to footwear. My sister never got uses to wearing footwear and she will walk barefoot every chance she gets. I’m glad to say I will be living in NZ again and I look forward to this old tradition! Someone wondered above why Australians aren’t into bare feet as much as NZers when in other ways they’re quite similar – it’s because there are more nasties in Australia that you have to watch out for (bugs and snakes) whereas there’s not really anything in NZ that can harm you. I’m a born and bred Kiwi and I still go to the mall without shoes on sometimes at the age of 42 – and I’m not a hippie and I live in the city. It’s more about whether I had shoes on at the time, and sometimes I just find myself there with no shoes. It’s winter now and I tell my kids to wear shoes to school in the winter term because it’s wet and cold, but no matter what I say they wear their shoes through the school gate then take them off and put them in their bag and go running off. My kids all say they hate shoes and run faster barefoot – I guess it’s just what you’re used to. But I can sympathise because like the other Kiwis who’ve posted, I spent my childhood and teenage years barefoot and developed tough feet and can walk on hard hot stony surfaces with little trouble – and I love the feeling too. Shoes just feel restrictive and it’s a pain putting them on when you’re in a hurry. 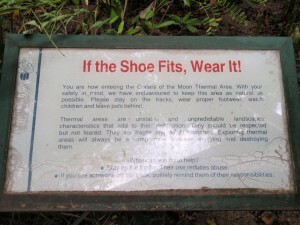 But I always wear something on my feet when I’m in Australia – don’t want to tread on a spider or snake!